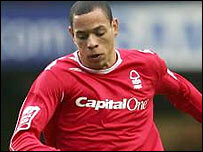 23 | January | 2008 | Through the seasons before us..
Late strikes get Forest out of jail at Millwall.. If you lurked on any number of Forest message boards during the second half of this match, and I did, then the hysteria in text was a sight to behold. Keyboards all over Nottingham have probably been worn out in endless tirades aimed mainly at Smoulderwood, borne out of frustration at being 2-0 down to Millwall. It’s understandable really, given our recent form we needed a win tonight really – but under the circumstances I’ll take the point gladly. Inevitably Neil Harris popped up to haunt us once again to make it two goals in two games against us since joining Millwall, in a half where Forest arguably had the better of play – but failed to convert their chances suitably. For all his detractors, Smoulds was earning pre-kickoff praise for his restoration of Wilson to centreback, to playing a four-four-two formation (albeit without any wingers in the side – Commons and Davies both consigned to bench positions). And for a while it looked like Smoulders had finally got something right, Sammy Clingan forcing an early save from an angle, Tyson heading over and Forest building the pressure on the home side throughout the half. Tyson did well down the left and crossed to Holt, whose header wasn’t firm enough to trouble Evans in the Millwall net. Millwall’s first real effort was a tame 20 yard effort from Forbes after around seventeen minutes which Smith had no problems with. Forest went back on the assault, with Chambers connecting brilliantly with a Sammy Clingan freekick only to see his header rebound from the inside of the post onto the prone Millwall ‘keeper, and eventually scrambled clear for a corner. Forbes again had a half-chance which he put over the bar from around the penalty. Go to your message board of choice, and find some posts from people listening to the game, and you’ll see a plethora of compliments – then scroll to just before Cohen scores for us, and see fickleness in action! Millwall, as we know by now, score first – and it’s pretty much against the run of play. That said, we were partially architects of our own downfall as Perch executed a poor challenge in the D. Neil Harris took the freekick which he curled expertly around the wall and into the top corner of the ‘net. 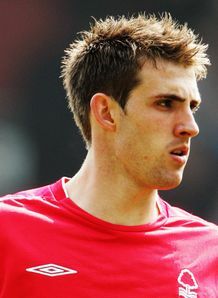 Why on Earth did we never see this side of him in a Forest shirt? It’s not like he didn’t get plenty of pitch time! This didn’t knock the stuffing out of the Reds though, who continued to forage forward positively – probably the most notable chance before half time fell to Cohen who was played through by Holt, unfortunately the midfielder was halted by an excellent last gap challenge by Senda. So half time came, the Forest fans applauded the team of warmly and some spark of optimism remained in messageboardland. The second half started with worries over Wilson who appeared unable to continue, but the defender shrugged off whatever was ailing him and upon leaving the field was keen to get back on. Unfortunately, a mere eight minutes into the half it was 2-0. A Bennett clearance went straight to Jay Simpson who was able to curl a shot perfectly beyond Smith and into the corner of the net. Now enters the frustrating period of the game – it became a battle, and as we know, occasionally (heh, okay, often!) Forest can go missing in such conditions. Holt was denied from connecting with a Tyson cross by Frampton, Clingan teed up McGugan on the edge of the area, but the midfielder was unable to hit the target. Millwall still had life in ’em too – Smith was forced into a save from Forbes. Arguably a bit late, it was about 12 minutes to go when Smoulders introduced Commons and Davies who replaced McGugan and the increasingly-harried-looking James Perch to give our side more attacking balance. The pair immediately combined, but despite turning well Davies wasn’t able to shake off Forbes who was able to block the route to goal for the substitute. The goal, of course, was to come though – five minutes remained when Clingan punted the ball forward to Holt, who managed to nod the ball down to Cohen who took a snapshot to put the ball into the left corner of the net from around twelve yards. And with a mere two minutes on the clock we were level, again thanks to good work by Holt with his head – this time flicking on to Tyson who beat his man and thumped the ball into the bottom corner inside the penalty area. And sadly, because we’re not Leeds, we were denied a late winner when the Millwall keeper Evans executed a quality diving save to deny Cohen a diving header from a dangerous cross by Chambers. Tyson was close to getting onto the rebound, but sadly t’was not to be – and we must content ourselves with a draw. Despite the inevitable euphoria of a late equaliser, it is a tad concerning that we’ve picked up so few points away from home. So we have a break this weekend before the not-exactly-welcome visit of Swansea City next tuesday – given our lack of points away of late, it becomes vitally important that our home form remains, and that is going to prove a struggle. Havant and Waterlooville aside the Swans are on great form and are sitting pretty at the top of the league – it certainly isn’t going to be easy, but then, Forest never make things easy, do they? Dowie gives up on Best mind-games..
Iain Dowie’s brash talk seems to have taken a backward step of late on the Leon Best saga. His recommendations of denying his transfer request were a pretty transparent mechanism to inflate our bid for him, or lure other clubs into some kind of bidding war for the services of the young striker. Only Ipswich came forward, and whilst arguably a better opportunity in league placing, it was bound to be geographically prohibitive for Best who is reportedly keen on a move back to his home town. Now, whether of course that translates to a transfer actually being agreed remains to be seen, but the fact that Forest have today allowed Scott Dobie to depart – despite his clear lack of favour – is suggestive that they’re reasonably confident of another striker coming in this month. At least I would hope so – I made similar assumptions last January when Forest allowed Southall to return to Gillingham, so there isn’t any chicken-counting going on just yet for me! There still remains the tricky subject of Forest’s latest bid (reported to be £1.1m in some quarters – I suspect it is considerably less) being short of Coventry’s valuation – but if they are indeed accepting defeat in convincing the wantaway player to stay, then I would hope we can move quickly to secure his services. All of this is assuming there isn’t a third party waiting in the wings to throw a spanner in the works. “I have put my view to the board and at the end of the day the lad wants to go and play for his home town club and that’s understandable, he’s a young boy who has done very well for us in patches and is one we brought in for the future, but he has got his views and we will see how we go between now and the end of the window. Certainly at the level they are talking about, there is not a deal to be done. He also confirms that whilst he’s had conversations with Ipswich Town about Best, there has been no bid lodged – by the way he speaks of Best’s eagerness to join up with Forest it sounds like it’s a no-goer anyway. So, assuming (big assumption I know!) that Forest are able to agree terms with the Sky Blues it would appear their patience in landing their man has paid off – so some credit is due there. If it comes off, of course. Gosh, what a busy news day! I’m off to listen to the match now – come on the Reds! Roberts out on loan – signal a new ‘keeper? Dale Roberts has been sent out on loan to Rushden and Diamonds, given he was our substitute keeper and Paddy Gamble is also out on loan, the remaining goalkeeper I know of on our books is Shane Redmond – who doesn’t appear to have a squad number. There was talk from Smoulds pre-January about cover for Paul Smith being one of the gaps in our squad he was looking at. Which leads neatly on to a rumour I heard much earlier in the month that around the Northampton Town dressing room it’s apparently common knowledge that Mark Bunn – who’s played at least one blinder against us – has pretty much sorted a deal to join us already. Of course, rumours such as these fly around from all manner of ‘sources’ during a transfer window so it remains to be seen whether there’s any legs in it. If our youngsters aren’t considered credible long-term cover for Smithy though, then it does make sense to get ’em some league experience through the loan system – so hopefully Dale will get plenty of games for Rushden to bolster his confidence in dealing with the step up to league football from primarily youth and reserve team levels. So good luck, Dale! Filed under: Transfers |	Comments Off on Roberts out on loan – signal a new ‘keeper? I feel sorry for Scott Dobie. In his time at Forest he basically became the punchline of any joke about ineffective or perpetually injured strikers – admittedly, not without just cause – and I quite frequently made jokes along those lines too. It’s fair to say his time at Forest was never really covered in glory since Megson signed him. It transpires that, despite our striker shortage, he is not in the plans of Smoulderwood – not even meriting a place on the bench when we’ve been desperately thin on the ground in his position. Oddly it’s a promotion rival in Carlisle – his home town – who have given him a way out of Forest limbo – a nominal fee has been agreed between the clubs, and the move will go ahead subject to personal terms and (the scary bit) a medical. So I find it mean to say nasty things about him, when he has featured for the side he’s been a tryer – but for whatever reasons, injuries and others, things just haven’t worked out for him here. Hopefully they work out elsewhere, albeit given Carlisle’s status as potential promotion rivals, perhaps we shouldn’t wish him too much luck! I do hope that part of the transfer conditions were that he can’t play against us – although I’m not sure you can do that when it’s a permanent transfer rather than a loan. The other thought underpinning this move is that given our shortage of strikers (assuming that yesterday’s signing isn’t going to come straight into first team reckoning), this transfer surely indicates that Forest are hopeful (I would say certain, but given their January track record I can’t quite bring myself to) of securing the services of a striker who will be in a position to compete for a first team place. 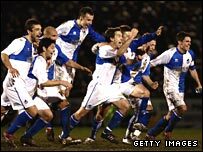 A weekend off for Forest..
Bristol Rovers tonight managed to beat Fulham on penalties in their FA Cup third round replay. This means they get to play their fourth round tie on saturday, rendering our league game with them at the City Ground a bit of a non-starter! A disappointing end to the evening’s proceedings, although who knows – if we manage to get a signing in before the window shuts maybe it’s a good thing? Congratulations of course are due to the Gas for holding their nerve to beat the Cottagers on penalties. While we’re at it, Derby too managed a giant killing of their own, limping to a draw after extra time against Sheffield Wednesday and eventually triumphing on penalties too. It must make a nice change for them to experience winning a game, mustn’t it? This means that whilst we’re resisting being dragged shopping with our other halves, fans of Swansea, Doncaster, Leeds or Carlisle could be celebrating an opportunity to put even more points on the board whilst we’re left with nothing but the dreaded game in hand. Of course, at least it can’t be both Donny and Swansea fans celebrating, as they meet one another at the weekend – a tough choice, lose more ground on the Swans, or have Donny overtake us in the table? More irksome is the fact that saturday has already been planned around the rituals of a home match, and now I need to find some alternative way to entertain myself! So it’s official, Fulham are rubbish and I’ve got a proper strop on! (I said strop! ).